Mia Dennett is missing. A dedicated teacher to inner city kids and daughter of a prominent judge, Mia doesn't show up for work one day and her coworker is concerned. Her mother is also worried, but her father and sister seem to think she just took off on a whim. What really happened to Mia? In The Good Girl by Mary Kubica, we hear the story of her disappearance and the search for her through the eyes of her mother Eve, detective Gabe, and kidnapper Colin. 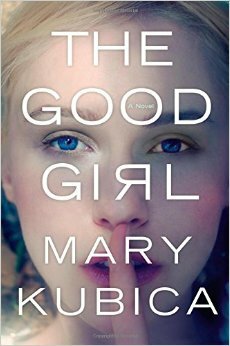 The Good Girl is a mystery that has been compared to Gone Girl by many. I don't agree with the comparison, and I've seen some other reviewers complain about this comparison as well. Please try to keep this out of your mind when you read this novel. I found the story fascinating, even if it is a bit predictable in some aspects. It kept my interest throughout. The middle does seem a bit slow, but I felt this was important to build relationships and storylines. Perhaps it could have been cut back a bit. I love how each of the main characters evolve and change throughout the story; they are all complex characters who make decisions that book clubs will spend much time discussing. I like that Kubica brings us into the hearts and minds of three key characters, each with a very different perspective on Mia's disappearance. I also like how Kubica tells the story from two different time periods ~ before and after. It sounds complex to have these shifts in time and also three different voices, but it actually works very well. Overall, I found this mystery intriguing and entertaining. It's definitely a character-driven story; there isn't a lot of action. But it was a page-turner for me as I was anxious to see how everything would come together in the end. I would recommend The Good Girl to book clubs who could spend a lot of time discussing the motivations behind different characters' thoughts and actions. This review was written based on a copy of The Good Girl that I received in a book exchange with my book club. This post includes Amazon Affiliate links. If you purchase something using my link, I will receive a very small commission but your price does not change. This sounds like a great book! I just added it to my wish list! Oooh...this sounds intriguing! I like novels with multiple perspectives, too. Thanks for the review! I do too! That's one of the best parts of this and it really didn't get confusing although it sounds like it would. I am not sure if this ever officially made it to my TBR, but I will be checking. Thanks for the great review and recommendation. Definitely get it onto your list! I'm not sure how I feel about this one. The ending was really not my cup of tea, but I did like how complex the characters were. I personally liked the ending but I tend to like the unexpected.